The government chose “turnaround” as the defining term to represent the state of TT’s economy, but the course of 2018 suggests “tumultuous” might be better. The year was defined by the closure of the Pointe-a-Pierre refinery and restructuring of Petrotrin, leaving 5,000 workers directly unemployed and an entire community unsure about its future. On the other hand, the government successfully launched the National Investment Fund, raising $4 billion to help offset its deficit. The country also signed the Dragon gas deal with Venezuela, hosted the Gas Exporting Countries Forum and successfully renegotiated terms with BPTT and Shell for Atlantic’s train one. However, the seabridge collapsed in February and has yet to fully recover, all but crippling Tobago’s economy. The country also finally showed sustained signs of growth, up nearly two per cent for fiscal 2018, continuing from the 1.6 per cent of last year. The year in business (and economy) began with a frank assessment of the country’s fiscal status, as the prime minister addressed the nation on January 7, outlining the constraints to revenue that his government faced, but ending, optimistically with the assurance that despite the sacrifices the population needed to endure, eventually, in 2018 there would be “turnaround” in the economy. Unsurprisingly, the driver of this reboot would be increased energy-sector activity. He also outlined the need for restructure in Petrotrin and the launch of the National Investment Fund, arguably two of the biggest news stories this year. Dr Rowley also noted that diversification away from energy was critical for the country’s survival. Just three days later, though, the chairman of the Economic Development Advisory Board (EDAB), Dr Trevor Farrell, quit after two and a half years, citing his lack of patience with the slow pace of public sector implementation. Farrell’s decision to leave was a blow that was considered to have more of an more impact on the economic progress of the country than the Prime Minister’s speech. The EDAB had been conceptualized as a launchpad for transformation of the economy, but after none of the board’s reports were seriously considered for implementation – including considerations for addressing declining revenue as well as energy efficiency – Farrell had had enough. Eventually, with Farrell gone, the board imploded, and in April, the government dissolved it. Concern over the state of the economy was put on pause as the country geared up for Carnival. It was however, difficult to tabulate the actual economic impact of the country’s biggest seasonal tourism draw, as the Tourism Ministry, Culture Ministry and the Central Statistical Office had no immediate information post-pretty mas. It was only in August that the stark figures from Carnival 2018 showed a 3,500 drop in visitor arrivals from the previous year. And while Trinidad tourism took a hit, it was nothing compared to the near-stagnation of the Tobago economy as, for much of the year, the inter-island seabridge was out of service. The crumbling started in December 2017, when the government cancelled the Ocean Flower II, a passenger vessel leased under the previous administration, because of questions about its procurement. For a while, the seabridge managed with just one boat, the TT Express, while its sister, the TT Spirit, was in drydock, where the 20-year-old vessel had been since July 2017. The boat was only supposed to be out for about a month, but its refurbishment was more extensive than anticipated, and it would be April before it returned to service. Until then, the 22-year-old Express managed the route – until “rough seas” and an expired licence forced it aground. The boat managed to regain its certificate of seaworthiness, but, going aground during the busy Carnival weekend meant thousands of tourists – and even steelbands – were left stranded. The Port Authority had to enlist state airline Caribbean Airlines (CAL) to provide additional airlift – including redirecting jetliners – to help ease the backlog of passengers. CAL also signed a wet lease with LIAT to provide service until the end of April to help with the Easter backlog. In the midst of it all, Port Authority chairman Allison Lewis, who had lent a measure of stability to the board, quit in March, despite Works and Transport Minister Rohan Sinanan’s pleas for her to stay. Meanwhile, as the seabridge stalled, the Galleons Passage, procured by the government to join the inter-island ferry fleet, was en route from China, and after a series of delays, arrived in Trinidad in July. It was originally due at the end of April, taking over from the LIAT wet lease. When it arrived in July, it was supposed to join the fleet within two weeks, to help facilitate the peak August holiday rush, especially since the government had decided to sell the Express instead of drydocking it. The Galleons Passage was not deemed worthy to ply the seas along the north coast to Tobago until October, finally joining its sister, rebuilding the seabridge. Alas, smooth sailing did not last long, as the Spirit, just this month, was taken off the schedule indefinitely because of technical problems. In March, the government hosted Spotlight on Energy, a follow-up to the previous year’s Spotlight on the Economy. Intended to be an engaging “public education” forum, Spotlight was instead a platform for senior government officials to chastise energy companies for not paying their fair share. The Prime Minister claimed there was up to US$6 billion leaking out of the public’s coffers because of incentives and other holes that meant TT wasn’t benefitting as it should. In April, after meeting with both Shell and BPTT in London, Rowley was to announce an empowered negotiating team with specialist lawyers and consultants who would negotiate on behalf of TT with energy companies. In November, Communications Minister Stuart Young announced the first successes of this team – first-round agreements with Shell and BPTT, including an extension of Atlantic’s train one for the next five years. BPTT was also given an extension on one of its licences that allowed it to expand two gas compression projects off the southeast coast. The company, TT’s biggest taxpayer, also announced a planned US$8 billion in investment in the country over the next decade. In the latter half of last year, the company’s Juniper platform began production, contributing significantly to energy output, and this year, its Angelin platform arrived in August, with production from that expected from next year. Shell also announced new production in its Starfish field and its Dolphin field extension. In late April, international credit rating agency Standard & Poor’s held TT’s credit rating steady for the first time in three years, even though it downgraded the country’s outlook from stable to negative. The rating was the boost Finance Minister Colm Imbert needed to deliver his “good news” mid-year budget review just a few days later in early May. An eager Imbert gladly shared the news that a bump in natural gas production meant that growth, projected at -2.6 per cent for 2017, was now revised up to -1.0 per cent. In May, the Prime Minister led a contingent including Minister in the Office of the Prime Minister Stuart Young and former national football captain Dwight Yorke to China. During the trip TT was formally incorporated into the Chinese trillion-dollar dream of a global trade route, the Belt and Road Initiative. Three major deals were discussed: a billion-dollar technology park in Point Lisas, anchored by ten Chinese tech firms; a code-sharing agreement between CAL and Air China, and a supply deal between Lake Asphalt and Beijing Construction and Engineering Group. During a memorandum of understanding signing ceremony in June, Young promised the deal was moving “full speed ahead” and construction would start at the end of this year – which with four days remaining, seems unlikely. In September, the Prime Minister signed a cooperation agreement with the China Harbour Engineering Company (CHEC) for the development of a US$500 million dry dock facility in La Brea. Construction would take four years and the jobs created would help absorb those who were retrenched from Petrotrin during restructuring. The second leg of the whirlwind May trip included a visit to Australian shipbuilders Austal. In July, the government confirmed it will buy two Cape Class Patrol Boats, which will join six Austal Fast Patrol Craft acquired in 2009. The vessels will enhance the border-protection capabilities of the country in conjunction with the existing Coast Guard fleet, and will join six Austal fast patrol craft acquired in 2009, although the Coast Guard’s ability to maintain the current fleet has come under scrutiny. The government also announced its intention to buy two fast ferries for the seabridge, also from Austal. After nearly three years of holding it constant, the Central Bank in June raised the repo rate to five per cent, up from 4.75 per cent. The reason Central Bank Governor Alvin Hilaire gave was that because of the widening interest rate differential between TT- and US-dollar denominated bonds, US bonds in relation to TT bonds gave more attractive returns on investments. The bank wanted to narrow that differential. The repo is the rate that the Central Bank charges commercial banks for overnight storage of excess reserves. Since the repo rate is effectively the borrowing rate for commercial banks from the Central Bank, it has an impact on domestic loan prices. About two weeks later, Republic Bank was the first major commercial bank to raise its rates, and RBC soon followed. In May, the government received its first repayment from the Clico Investment Bank to settle at least part of the nearly $24 billion debt owed to taxpayers after the Clico bailout in 2009. The State was repaid about $6 billion, including just over $4 billion in Republic Financial Holdings Ltd shares. The government decided it would use these shares, together with 100 per cent of its holdings in Trinidad Generation Unlimted (TGU), worth $2 billion, to create a fund worth $8 billion. It would then issue savings bonds, sold at $1,000 each to make it accessible to the widest population possible. The bonds’ initial public offer opened on July 12 and closed on August 8. Despite the Opposition Leader’s claim that the NIF was a Ponzi scheme and illegal, in an effort to dissuade the public from participating, the Finance Minister said the fund was oversubscribed by about 80 per cent. The aim had been to raise $4 billion, but it received offers totalling $7 billion. The surplus $3 billion only proved to the government that there is an appetite for investment in TT, and hence Imbert announced at a political rally in August that up next for the government would be housing bonds. Imbert also said in the 2019 budget presentation that a NIF 2 would come on stream sometime next year. After two years of planning, the governments of TT and Venezuela finally signed off on an agreement to develop the Dragon natural gas field, off the west of Trinidad, but in Venezuelan waters. Two agreements were signed in Caracas on August 25 – a government-to-government agreement for partnership on the arrangement, as well as a term sheet between Venezuela’s state oil company, PDVSA, Shell, and the National Gas Company. Since then, little else has been said about the proposed billion-dollar pipeline that will connect the field to the Hibiscus platform, off the northwest coast of Trinidad, owned and operated by Shell and the TT government. It is also unclear if the deal is actually allowed, with some members of the Venezuelan National Assembly claiming it is illegal. Nonetheless, the government is still hoping for first gas from Dragon to start flowing from 2020. 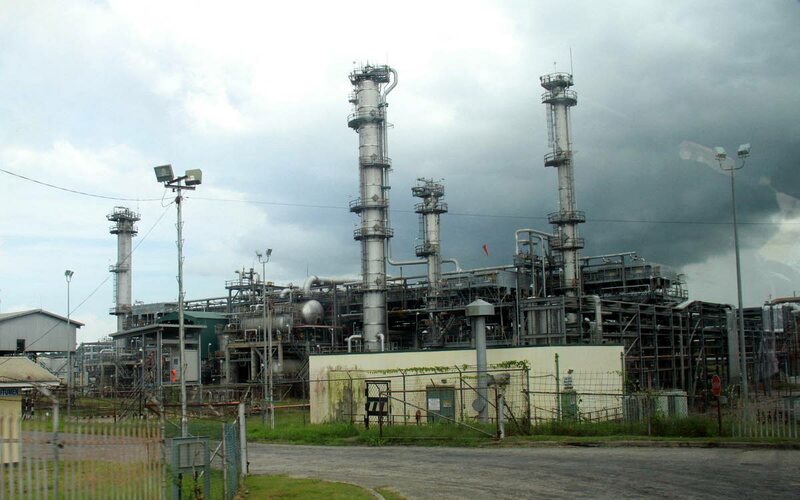 Just three days after signing the Dragon deal, the government announced the closure of Petrotrin’s 101-year-old Pointe-a-Pierre refinery. Though not unanticipated – the company’s board had said since February it planned to restructure the much-maligned state entity – the news sent shockwaves through the country, not the least the company's fenceline communities and nearly 5,000 employees. It was arguably the biggest story of the year. The most difficult part, however, was ascertaining accurate information, with the government and the board sometimes seeming divergent on message. Ultimately, despite the appeals of the majority trade union, the Oilfield Workers’ Trade Union (OWTU), whose influence was now severely depleted, sometime in mid-November, the last barrel of oil was processed and after, the plant went quiet. Operations at the refinery were shut down completely by November 30. Three new companies were established in the wake of Petrotrin: Heritage Petroleum, to deal with exploration and production of oil; Paria Trading, to oversee bunkering and distribution of fuel; and Guaraca Refining Company, which will hold the refinery’s assets until a plan is determined. These will all be placed under the umbrella of Trinidad Petroleum Holdings Ltd. Last month, Parliament agreed to vest the assets of the former Petrotrin into these three companies. On October 1 there was news of a convincing win for Team Rowley in the PNM internal elections. There were no real surprises – the budget was almost a rehash of policies that existed before – but Imbert did announce a 25 per cent increase in the price of super gasoline, a host of policies intended to create social safety nets – and a $2.6 billion termination package for laid-off Petrotrin workers. Social safety nets in the form of an overwhelming outpouring of donations from business and private citizens alike proved invaluable after three days of incessant, torrential rain caused some of the worst flooding ever seen in Trinidad. Residents of Greenvale in La Horquetta, Oropune housing development, as well as Kelly Village, had to be evacuated, some from their roofs, after rising floodwater, over ten feet in some areas, inundated their homes. In total, the government spent over $80 million in grants and other assistance, while TT was also able to access about $17 million in flood insurance from the Caribbean Catastrophe Risk Insurance Facility. After the first reading in May, government again reintroduced the Income Tax (Amendment) Bill in the Lower House, confident that its clauses aimed at making TT compliant to the regulations of the Global Forum on Transparency and Exchange of Information for Tax Purposes and Financial Action Task Force would be passed. The Opposition, however, had a different idea. After weeks of stalemate, a looming deadline for compliance and wary bankers concerned of the real threat of derisking, a weakened bill was passed without Opposition support, supposedly giving TT some breathing room to renegotiate a new bill by the time these bodies convene to evaluate the country’s progress. In the interest of transparency, the government and Sandals released the much-discussed memorandum of understanding for the proposed luxury hotel development in Tobago. The MoU had been signed over a year before, but the details had not been made public, although activist Afra Raymond had recently petitioned the courts under the Freedom of Information Act to access the details. As the year wound down, Republic Financial Holdings Ltd, Scotiabank and Sagicor sprang some well-timed surprises. In a media release on November 26, Republic announced it would acquire Scotiabank’s Eastern Caribbean, Guyana and St Maarten assets for US$123 million. Barbadian financial giant Sagicor announced it would merge with Canadian Investment firm Alignvest Acquisition to create a US$900 million and would delist from the local stock exchanges. The year wasn’t done with shake-ups: two weeks before Christmas, state telecoms company TSTT handed out retrenchment letters to 51 non-union staff, including senior managers, on the heels of 503 job cuts a month earlier. These cuts, together with those at Petrotrin, mean that in the latter half of 2018, nearly 6,000 people lost their jobs. Finance Minister Colm Imbert was clear in both his mid-year budget review in May and his national budget presentation for 2019 that the country isn’t yet out of the woods. Oil prices keep tumbling as the US, for the first time in 75 years, became a net exporter of oil as shale oil production booms. The budget was predicated on an oil price of US$65 per barrel, but at the time of this writing it was just under US$46 per barrel. Despite TT being primarily driven by natural gas, oil revenue still contributes five per cent to the country’s gross domestic product. It will also affect the profitability of the new exploration and production company formed from Petrotrin’s exploration and production assets, Heritage Petroleum, whose main product will be crude oil. Now that the refinery is shut down, the country will also have to import fuel, which will be comparatively more expensive, especially since the government is already moving away from the fuel subsidy. And in 2019, the full impact of nearly one per cent of the labour force losing their jobs almost simultaneously will have been properly measured – not to mention the trickle-down effect on support services. There’s also likely to be a renewed effort to pass tax compliance laws in order to stay alive on the international financial scene. TT will be facing a whole host of new challenges in the new year – as well as a slew of the same. It remains to be seen whether the “turnaround” can take the country along a new path or whether it's just a U-turn down the same old road. Reply to "Turbulent year for the economy"